Sitar and Its Music is a revised and enlarged edition of a much sought after reference book on instrumental music, appeared as Sitar and Its Techniques, in 1981. It is a serious attempt to convey the basic principles and allied information on sitar and its music, keeping in mind its absolute usefulness for the students who want to learn sitar and our great tradition. The book vividly deals with gharana, especially its contribution to the existing and traditional Indian classical music. It conveys the instrumental aspect of Indian music in relation to sitar playing, largely benefitting the students of music, especially that of sitar. It also brilliantly covers other main aspects of music such as ragas, tals and gharana. The book is a blend of theory and practice, and an attraction to those who are about to step into the magnificent world of sitar. Its text is easy to read, language is simple, and explanation is elegant. This book will be a great asset for every student of Indian music and those who plan to learn and know about sitar and classical music, explaining its historical and practical aspects. Pt. Devabrata Chaudhuri, popularly known as “Debuji”, is a legendary sitar maestro, trained under Sangeet Acharya Ustad Mushtaq Ali Khan. He taught music at the Faculty of Music and Fine Arts, University of Delhi and was its Dean and Head. He was conferred Honorary D. Litt. By Indira Kala Sangeet Viswavidyalaya. A foremost exponent of gharana, Debuji is an awardee of Padmabhushan, Sangeet Natak Akademy Award, Rasewar award, All India Critic’s Award, Prayag Sangeet Samiti Samman and Tansen Award among others. He has written six books and presented more than fifty papers in national and international conferences. The name of Pandit Debu Chaudhuri is synonymous with sitar and he is known for his inimitable style in the art of playing sitar, which is widely acknowledged and adorned by the connoisseurs of Indian music. Presently, he is the honorary secretary of Ustad Mushtaq Ali Khan Centre for Culture (UMAK). Formerly, he was dean, faculty of music with for forty ears. He has to his credit six books and a good number of papers published in various leading newspapers and magazines of repute. Pandit Debu Chaudhuri has performed in many countries across the world. He has also recorded many popular albums and created eight new ragas. He has won several awards including Padma Bhushan and Sangeet Natak Akademi Award. He is widely known not only as an outstanding performer of international repute but also as a respected guru, author and composer. We have gone through the book written by Pandit Debu Chaudhuri titled Sitar and Its Music. It is no wonder that his book published thirty years ago on the same subject was appreciated widely and was in great demand. It also was a reference book on instrumental music in many universities in India where music is taught. We understand there is a persistent demand of this book and he has spent time to bring out a persistent demand of this book and he has spent time to bring out a revised publication adding some new information for the benefit of the students. We have known Pandit Debu Chaudhuri since he was a teacher at University of Delhi in the faculty of music and fine arts, in the early 1960s (since its inception). Though he has now retired after forty years of teaching which gave him enough experience about the numerous problems of the students of music. There are very few authors on music who also happen to be performers of high standard, and that is why this book is written keeping in mind the issues related to learning of sitar in any institution. Pandit Debbu Chaudhuri is a devote student of Ustad Mushtaq Ali Khan Sahib of Senia Gharana. He has now wholeheartedly taken up the mission of conveying the instrumental aspect of Indian music in relation to sitar playing which will certainly benefit largely the students of music and that of sitar in particular. Many people may not know that Debu Chaudhuri, while working in University of Delhi, had also been engaged in teaching of theory also. Although he is widely known as a performer he also has an outstanding record of guiding around forty Ph. D scholars. It is no mean achievement to have guided as many students of music for the degree of philosophy in music as well as performing and writing books on music with equal zeal. One quite interesting chapter to read is where he has dealt with the subject of gharana. Here he has tried to touch upon, in brief the gharana’s contribution to the existing and traditional scenario of Indian classical music which could be a subject of interest to the students of music today and in the days to come. In some other chapters, he has brilliantly covered certain aspects of our music including ragas, tals, and gharanas, especially the Senia Gharana. Indian musicology cannot be complete without the mention of Senia Gharan, and we fortunately happen to know his guru ustad Mushtaq Ali Khan Sahib, a true representative of Senia Baaj, who passed away in the year 1989. Khan Sahib was a staunch follower of the Senia style and never sacrificed his style for the convenience or for the sake of public appreciation. That is why we find that the author has all the while tried to maintain the principles followed by his revered guruji. We have no hesitation in saying that this book will be of a great help for many in India and abroad not only because of the practical aspects but also the theoretical aspects as well. While taking of theory the author is particularly aware of the fact that it is not a book on theory but is meant for those who are not imitated to the art of sitar playing or are yet to be initiated in the art of classical music. While reviewing the book we were simply charmed that he has not attempted a controversial work but has tried to focus on the subject from the academic point of view. The author has given a very interesting account about the sitar and its technique and other nuances. We both are happy to note that he has made the text easy to read and understand and explained things in a very simple manner. We feel great pleasure in writing the foreword for this book which will be a great asset for the students of India music and all those who intend to learn and know about sitar and classical music. Sitar and Its Music by Debu Chaudhuri is a projection of his log and devoted pursuit of music. Indeed, Debu has, now, after more than thirty-five years of living with music, reached a point of advantage where the sitar with its techniques and potentials and ragas with either subtleties and ethos have all become part and parcel of his very being. Debu has learnt well, he has performed widely and with eminence; and has taught with credit. While he has all respect and regard for tradition and has great devotion for his guru, he also has an enquiring and analyzing mind. It is against this background that this book sitar and Its Music acquires a unique significance and becomes a truly welcome event in the context of teaching and learning of Hindustani Music with sitar as the medium, both in India and abroad. Running into four sections, the book starts with a brief account of “Indian Musical Instruments” through the ages. Moving on to a detailed description of the structure o the sitar, chapter 2 goes o to explain and spell out the different facets of sitar techniques right from the stance or position in the holding and handling of the instrument to the actual production and movement of sound with its varied manifestations. This chapter is enlivened with profuse and vivid photo illustrations demonstrating the major and minor details of primary importance. These illustrations, together with their verbal descriptions, can be of immense help in understanding the actual do-how of the practice. Were these to be accompanied by their counterpart in recorded sound, the overall value and utility would be further enhanced. Debu might consider addition of such a completely documented complex for his future publications. The remaining three chapter deal with basic element of Hindustani Music, an outline of ten basic ragas with compositions, followed by a fascinating account of a few newly-devised ragas and angles and avenues in some of their already established ragas. It is great pleasure and a proud privilege for me to commend and forward to the world of music sitar and Its Music by “Debu, my esteemed friend and colleague. I feel great privilege in presenting this work to the readers of Indian music. There have been lot many books on Indian music written earlier, but very few are written on sitar and its profound facets. It was a great dilemma for me when I started writing my first book n Sitar and Its Technique some forty years ago; I was not sure as to how the readers would accept my attempt, especially the students of music. after the release of the book in the year 1981, it was an immediate success and the first edition was out of print within few months. Ever since I have been receiving requests from India and abroad for copies to be mailed, but unfortunately because of my preoccupation, I could not attend to the issue. As dean and head of the department of music, University of Delhi, I had the added responsibilities to look after the department as an administrator and a guru as well. In addition I also had to carry on my profession as a torch-bearer of the Senia Gharana by propagating and performing of India and abroad. The new work, in a way, is a revised edition of the book Sitar and Its Technique published earlier. I have also added some new chapters and more information based on my later research work. During this period I have been receiving many queries on my book, I realized that I must bring out a fresh updated edition particularly so as this book has been prescribed as a reference book in many universities in India and abroad. I often receive demand letters from this institution for the book. My attempt has been to make this book more attractive and easy to understand for the students of music, both Indian and foreign. Whatever I have written in this book, has come from my experience as a student as a student learning from my esteemed guruji Ustad Mushtaq Ali Khan and as a teacher in the faculty of music, University of Delhi. While rewriting this book, I have altered some earlier chapters and added some new information wherever required, keeping in my mind its absolute usefulness for the students who want to learn sitar and our great tradition. In the last chapter I have also included eight new ragas composed by me. Some of them have been widely appreciated by the connoisseurs of art and many musicians, including my students, have been performing and practicing them. Whatsoever I have tried to convey in this edition, I always kept various aspects of the gharana and the teachings of my guruji uppermost in my mind. I would feel extremely satisfied if my purpose of this work helps the students, musicians and other readers who are keen to know the various aspects of playing sitar. 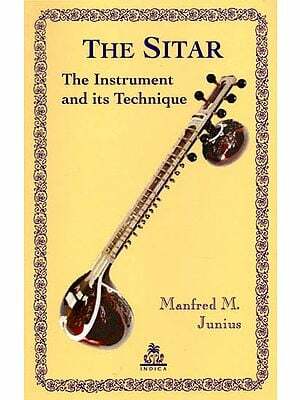 This book is an attempt to convey the basic principles and other related information on sitar and its music. I have not tried to make everyone a master nor have I tried to convey everything through this work. One may find some relevant topics or some other information missing but I confess that it is not deliberate and sincerely feel that many more things on the subject can be incorporated in the future edition. I hope I will, after having the requisite feedback from my readers and critics, try to do much better in the days to come. I would be failing in my duties if I do not pay due regards to my revered gurji the late Ustad Mushtaq Ali Khan Sahib who has been a great source of inspiration in my life. Though he taught me music, he also taught me how t o respect and maintain the sanctity of our age-old Senia tradition, playing sitar with 17 frets only. I have also been taught to respect other gharanas and that is why I have refrained from making any comments on topics which could results in unnecessary controversies. Finally, I would like to express my gratigude to my son Prateek Chaudhuri and my daughter- in-law Runa Chaudhuri who inspired me to bring out this new edition. I would also like to express my gratitude to my students Ravi Sharma, and Panchali Nandi for editing the manuscript and helping me to bring out this edition which perhaps would have not been possible without their sincere devotion and effort. I am also indeed grateful to Shalaj Mittal, and the editors at the Avi Publishers o taking great pains and also accepting my delays in completing the edited version. As an author I have tried my best and shall keep on trying so because it is about the music, which I call the “ocean of music” that cannot be fathom just in one life!